The Three Rs: Rants, Raves and (Occasional) Reflections: "Next Time You Want to See a Movie, It Had Better be a Disney Movie!" "Next Time You Want to See a Movie, It Had Better be a Disney Movie!" Happy Halloween, everyone! Today's post is one I've thought about doing for a long time now. It just fits the occasion. 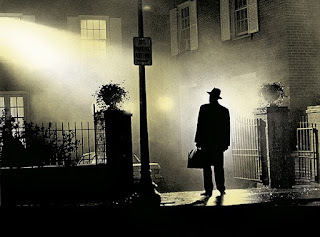 Back in 1973, I talked two friends, Shirley and Yvonne, into going to see The Exorcist. They were reluctant at first, but allowed themselves to be persuaded. If you've seen the movie, you know there are a couple of real appetite-killing onscreen moments. During one of those moments, both of my friends abruptly shoved their bags of chips at me. Being stuck in the middle between two unhappy moviegoers can be an awkward thing. As we were leaving the theater, they issued a warning: "Next time you want to see a movie, it had better be a Disney movie!" The following year, I transferred from Jefferson College to Saint Louis University. That was where I learned the true story behind The Exorcist. It was legend around the campus. The exorcism on which the movie and William Peter Blatty's novel were based took place at SLU. The details can be found on the University's website, but the child who was believed to be possessed was a boy, not a girl as was the case in the movie. The child, known only under an alias, was from the Washington DC area, but was brought here to a relative's home. The Jesuits performed the rituals at three locations--the relatives' home in Bel-Nor, the Jesuit rectory at St. Francis Xavier College Church on the SLU campus, and at the Alexian Brothers Hospital in south St. Louis. The old rectory was torn down and replaced in 1966; the hospital building where the final days of the exorcism took place was leveled and rebuilt in 1978. I didn't see the movie, but had read the book. I'd also read somewhere it was based on a true story and the child had been a boy. I did not know the rest of the tale. Interesting that the two public institutions torn down and rebuit. It makes me wonder about the relative's home. That's the only one not mentioned. I've always liked the soundtrack, spooky as it is! I'll pick my own movies, thank you. LOL The other night my other half picked a Tarantino movie called True Romance because of the title. Needless to say, he's not picking for a while. Lots of blood, shooting, etc. Yikes! You can't always go on the titles (that must have ruined date night for more than a few couples)! I've seen it two or three times. It's good, but not a pleasant experience! I had a Ouija board. After seeing the movie, I never touched that thing again. I had no idea it was based on something that actually happened. I read the book, too. Not quite like the movie, and I found the characters somewhat unlikable. At the time I saw the movie, I didn't know, either. I read the novel after I saw the movie. I recently read a book (Possessed by Thomas Allen) on the possessed boy that inspired Blatty's novel. One of the priests involved in the exorcism had kept a diary of it which had been hidden/concealed for years...this book was scarier than the fictional version! That book is also mentioned on SLU's website, I believe. I just do not like scary movies. I also never touch Ouija Board. Funny post today ! I loved it. You're brave! Movies like that give me horrible nightmares so I avoid them. In fact, I can't even read Stephen King! I don't care much for today's horror movies--too much gore. But I love the older movies, like The Omen, the Exorcist--psychological horror rather than every bloody detail.